Two recent clinical studies bring good news to the aging population. If you have lower back pain, burning pain or numbness in your legs you are probably one of the many people suffering with Lumbar Spinal Stenosis (LSS) – a condition affecting a vast majority of the over-60 age group – and this good news applies to you. The condition is most often part of normal deterioration due to aging but can also be caused by osteoarthritis, bone spurs, bulging or herniated discs, or injury or trauma to the spine. It can be hereditary, too. “It’s possible to have spinal stenosis while experiencing no symptoms at all, or the symptoms can appear slowly and then gradually worsen over time,” says Dr. Michael Perry, medical director of Laser Spine Institute. The condition has been treated for years with invasive surgery which can be risky – especially for seniors – and not always successful. The studies by Laser Spine Institute, published in the “Journal of Spine” in January 2013 and the “Journal of Orthopaedics” in March 2013, showed that minimally invasive surgeries are more successful than open back surgery at treating patients with LSS. The studies used real-life cases to prove that doing the procedure in an outpatient setting is a safe and effective option to treat even severe LSS conditions. The studies also found that minimally invasive surgery results in fewer risks, including lower complication rates, lesser rate of blood loss and a quicker recovery time. Spinal stenosis occurs in the spinal column, where the spinal cord, nerve roots and vertebrae are located. Over time, the spinal canal may become constricted or narrowed. This puts pressure on the spinal cord and spinal nerve roots, causing pain, numbness or weakness in the legs. The lumbar region is the lower part of the spine, and is the most common area where spinal stenosis happens. Dr. Perry provides some guidance on how to maintain a healthier spine and possibly prevent the onset of conditions like spinal stenosis. Some of his recommendations include exercising and stretching regularly, maintaining a healthy weight, using proper posture and lifting techniques, as well as ensuring correct body postures are used while sleeping and driving. Additionally, adequate rest, anti-inflammatory drugs and physical therapy may ease your symptoms. If you’ve tried all these and still have severe, limiting pain that is interfering with daily activities, it may be time to explore surgery. In the past, a surgeon typically performed open back surgery, called a laminectomy (or decompression), which removes the bone, bone spurs and ligaments that are compressing the nerves. The doctor makes a single, large incision to access your spine. According to the American Association of Orthopaedic Surgeons, elderly patients, those with multiple medical problems and others, have higher rates of complications from this type of surgery. There could be nerve injury, blood clots, return of symptoms and more. A several-day hospital stay is usually required. Additionally, a 2010 study published by the American Medical Association found that these invasive surgeries resulted in a high rate of life-threatening complications, and patients were often re-hospitalized within 30 days. A less invasive surgery is gaining popularity. Minimally invasive spine surgery using endoscopic techniques – sometimes as outpatient surgery – is becoming more common. In this procedure, small incisions are used and recovery is often quicker, with less injury to the surrounding soft tissues. Dr. Perry says that most surgeons and medical practices are moving toward these minimally invasive techniques because patients are requesting them. 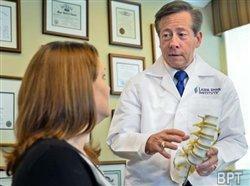 The surgeons at Laser Spine Institute are industry leaders in this type of procedure. Laser Spine Institute has regional surgical centers in Tampa, Fla., Scottsdale, Ariz., Philadelphia and Oklahoma City. For a free MRI review and information about Laser Spine Institute procedures, visit www.LaserSpineInstitute.com, or call toll free (866) 249-1627.